What's Become of the Holy Grail? Sunnyvale Manor II residents Paul and Andrea Catura (with son Ben) want to see young families bring back the Eichler footprint to their neighborhood. Two fairly original Sunnyvale Manor II exteriors today—including one with an intact front service yard. As modern neighborhoods go, they can't get more historic than the one Paul and Andrea Catura call home. But they also can't get more obscure. It's a place that doesn't look much like an Eichler development, for one thing. The long, low-gabled roofs with clerestory windows and steep gables that add appeal to so many Eichler neighborhoods are not here. No atriums either. And kitchen windows that open onto the street add to the un-Eichler vibe. And it's a place that no longer has a name. "No one calls it anything as far as I know," Paul says. It might also be the only Eichler neighborhood that doesn't know it's an Eichler neighborhood. 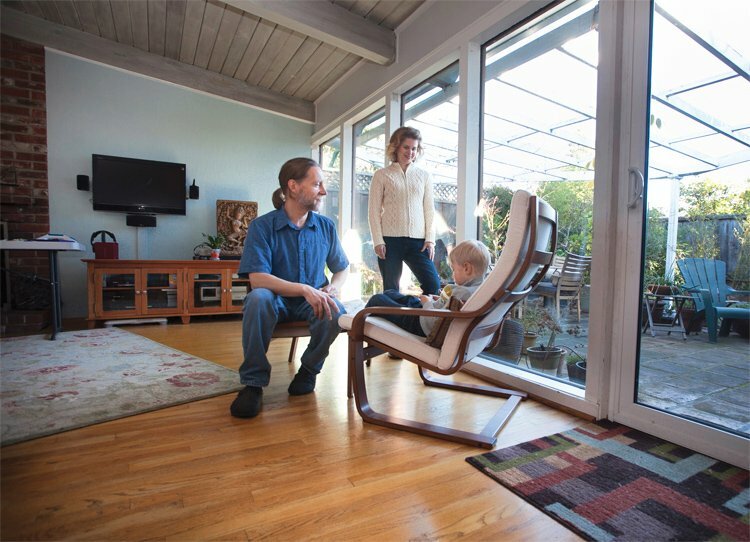 "I'm sure a lot of the people [in the neighborhood] don't realize their home is an Eichler," says Trudi Ryan, the Sunnyvale planning officer who staffs Sunnyvale's Heritage Preservation Commission. "The homes don't have the later look more associated with the houses." Still, for Eichler fans, the 51-home subdivision known as 'Sunnyvale Manor II' and 'Sunnyvale Manor Addition' represents the holy grail of Eichlerdom, according to area realtor and Eichler fan John Fyten. They are not the first homes Joe Eichler built. But they are the first Eichlers built to original designs by architects—Bob Anshen and Steve Allen, whose firm Anshen and Allen established the ethos and the look for all that followed. "The prototype of the ever-evolving Eichler model," Fyten called them. 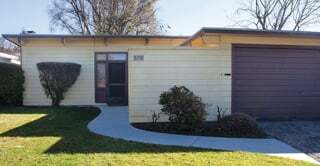 Eichler's first few subdivisions were based on designs either by a building designer, whose name remains unknown, or by plans borrowed from other builders. These include the first section of Sunnyvale Manor (Sunnyvale Manor I), Palo Alto's University Gardens and Stanford City, all built in 1949, and Stanford Gardens, built in early 1950. But Bob Anshen, a brash, young man who had been invited to design a custom family home for Joe Eichler, did not approve of the quality of Eichler's original tract homes. "I'll design you a better house," he told Joe, according to Ned Eichler, the builder's son. "How can you design a house that can sell for $10,000 when you can't design a house for me I can afford?" Joe argued, then turned and walked towards his office. "Two thirds of the way there," Ned recounts, Joe "said, without turning around, 'Do it.'" Original interior and backyard views from 1950 photos. The result was the first real Eichler plan, the AA-1, a compact, three-bedroom home with the front door opening directly onto the living-dining room, one small bathroom, and a kitchen by the front door—with a window looking onto the street. The homes were built in 1950 and sold for $9,400. 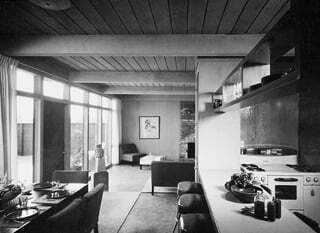 Photos of the homes when they were new show just how gorgeous these simple, efficiently laid out houses could be—glass walls letting in light and a sense of space, redwood walls providing warmth, no wasted space, not a smidge of pretension. "All the very latest scientific developments that mean quick and easy housekeeping, complete comfort," the ads promised, "as well as trim beauty of clean-cut modern lines." Most of the 1,000-plus-square-foot homes are flat-roofed. Some have low shed-style roofs angled in one direction. Most of the homes are T-shaped, with a projecting garage and bedroom wing in the rear.